New Central Bank president admits government has ‘made mistakes’ as prepares to lead in wake of IMF deal. The surprise resignation of the now former Central Bank president, Luis Caputo, on Tuesday created room for a new face at the helm of the institution. 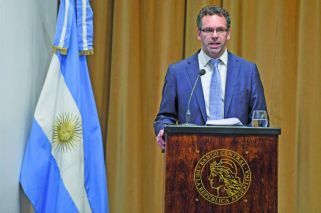 Guido Sandleris, an academic at the Torcuato Di Tella business school in Buenos Aires, a former World Bank and Inter-Development Bank official and a current deputy to Economy Minister Nicolás Dujovne, was tapped to fill the void. Sandleris, 47, is taking over a highly volatile position and will have to deal with an equally volatile exchange rate and soaring inflation in Argentina. Caputo, who the presidency resigned citing “personal reasons,” lasted just three months in the post. The appointment of Sandleris represents the return of a more academic approach to the Central Bank’s leadership. Prior to Caputo’s short spell, Federico Sturzenegger held the presidency for two-and-a-half years, frequently giving eloquent speeches at conferences around the world and introducing more transparency to the financial authority’s work. Based on his immediate comments this week, Sandleris will be working hardest to reduce the inflation rate, currently standing at 34 percent annually but expected to top 40 percent by the year-end. The new chief said he would work to recover the “stability and predictability of prices” that Argentina needs. “It’s an honour to take over the Central Bank presidency and I would like to thank President Mauricio Macri for the trust he had on me to deal with this new phase,” he said in a brief press release distributed by the Central Bank. Speaking at a press conference on Wednesday, Sandleris said “international financial volatility has caused an acceleration of inflation, a fall in economic activity and a depreciation of the currency in our country and these months have made clear the magnitude of the challenges we face.,” as he admitted the government had “made mistakes in its attempt to cut the deficit and lower inflation. Pablo Quirno, a director at the bank, is said to be leaving. Gustavo Canonero, the first vicepresident, will stay on as Sandleris’ immediate deputy. Sandleris has degrees from the Universidad de Buenos Aires, Columbia University and the London School of Economics, and has an associate professor role at Johns Hopkins University. He worked as a consultant for the InterAmerican Development Bank and for governments in El Salvador and Uruguay. A teacher at the Di Tella University since 2007, Sandleris ran the Finance Research Centre there and was the dean of the Business School between 2014 and 2015. He was also a visiting professor at LSE and at the Universidad de Los Andes, before joining the Mari administration in 2017 as head of advisers at the Finance Ministry. Sandleris specialises in the international economy, finance and macroeconomy. His academic contributions have generally focused on the effect of the financial crisis and the costs of defaults and his work has been published in several journals, such as Journal of International Economics. In a more unusual literary path, local outlets also reported this week that he had published children’s books themed on football. On his Twitter profile, Sandleris introduces himself first as a fan of both writer Jorge Luis Borges and his favoured club, Boca Juniors. In recent posts on the social network, he has often reflected back on living in the United States during the September 11, 2001 terror attacks and shown his admiration for retiring Argentine basketball player Manu Ginóbili. Despite Caputo’s claims of personal reasons, reports this week suggested alleged tensions between him and Dujovne had contributed to his decision to step down, which came just a day after President Mauricio Macri had said the government’s new aid deal with the IMF would require a new approach to monetary policy. After the news became public, officials said the shock resignation came as no surprise to most. Privately, however, they criticised its timing. The shortness of Caputo’s tenure suggests he too will take the fall for the country’s failure to stem the slide in the peso, which has tumbled more than 50 percent so far this year, the most in emerging markets. Caputo , a former JPMorgan Chase & Co and a Deutsche Bank trader, raised rates in August to 60 percent – the world’s highest – but the move failed to stem the currency’s decline as investors questioned the country’s ability to meet its financing needs amid a second recession in three years.